Well hello to you my reader chums! 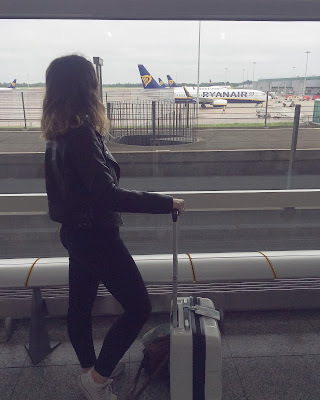 Whether you're a consistent reader of my posts (especially the travel ones) or have hoped onto my blog for the first time today, I wanted to talk about my love of travel and hopefully inspire a few readers to take the plunge, and travel. Travelling is my favourite ever hobby, and every time I come back from a trip I can't wait to go on my next one. A few years ago I never would have pictured my life the way it is today. I'm constantly thinking about my next place to visit, and have an overwhelming feeling of wanderlust at pretty much every waking moment. Back at the age of 18, this was never the case; I was constantly afraid of the world. The thought of travel was scary, completely out my comfort zone and, expensive. Oh how I was wrong. Although any new place can be scary, once you've got your bearings, exploring is the most exciting thing, and everyone should experience a little wanderlust. Often a misconception of travel is the 'expense', and although travelling to the other side of the world isn't going to be cheap, it's not as pricey as you may think. It's all about knowing where to look for the best deals and that comes with experience. Skyscanner or Kayak are great websites for comparing flights and finding the cheapest times to fly. Booking.com and Airbnb are my go to for finding affordable accommodation, and I usually flick between the two depending on where I'm visiting. Travelling cheap is all about the research you do, and finding where to look. Consider swapping lavish hotel rooms for cheaper bed and breakfasts, staying in an apartment or a hostel. As budget travel is such a trend, there are plenty of affordable and safe options to make that trip of a lifetime, a dream come true. I can't stress this point enough. Life isn't to be lived in only one place when there is a whole world to see. From city to city, country to country, continent to continent, there's something unique to see. Every location in the world has their own thing, whether it's gondola rides in Venice or riding the bicycle life in Copenhagen. There is something new and exciting to discover - and if you don't book yourself a flight, you'll never experience it for yourself. I've seen nowhere near as much of the world that I want to and I'm starting to create plans to make it a reality. I want to soak up the Asian culture, lounge on the beaches in Bali and see what the hype of South America is like. I've done quite a few countries in Europe, however I've had some of the best memories there and would love to explore more. I don't think my love of travel will ever stop, and there are many destinations I can't wait to see one day. Isn't food one of the best things in life? And as much as we have a variety of cuisines in the UK, it's not the same as eating it in its home country. I'm talking about having pizza in Naples, curry in India and a Thai dish in Thailand. The world is full of delicious flavours, and not venturing out means you're missing what could be a favourite meal of yours. Wherever you go you'll meet new people, whether it's work or hoping on your local bus. However, meeting people when on your travels makes it even more special. You can find out their travelling story, or if they're a local take in the knowledge of the surrounding area. If travelling alone especially, it'll give you the opportunity to have company on your trip and even make a life long pal. Every time my friends and I book a trip, we always say 'just think of the stories', because essentially when you're old and grey you won't remember that expensive bag you bought but all the experiences you've had. You'll remember the time when you went up the Eiffel Tower, met the elephants in Thailand or jumped out a plane, and you can tell these stories to your kids, grandkids and friends. You'll be creating the best ever memories and gain a lot of worldwide experience along the way. The world is your oyster, go and explore it. It goes without saying that very country has a different culture and unique to the next. One of my favourite things about travelling is learning and experiencing that new culture, and seeing how different cultures live. For example their working day, mannerisms and how they interact with tourists. Every country will have something new, and whether you're used to it or not, it's a great learning curve. I always think go into a new country with an open mind as you'll never know what you may discover. I hope you enjoyed this post and it gave you a little inspiration to travel. Where is your next trip? Totally agree with your point about the world being such a big place. It makes picking destinations to travel to soooo hard though, there is just so much to see. Great post!